Finish the following phrases: mashed potatoes and …? ; peanut butter and …? ; buckwheat and …? Oh, that’s right, you don’t eat buckwheat by itself or with anything else. Recently while browsing the Russian store with Dave and explaining what some of the foods are, I realized that many of the items are just not well-known or undeservedly forgotten in this country and the American people are missing out on a huge list of tasty and nutritious products. So I decided to feature and item or two and hopefully get some people interested in trying it out. Buckwheat was apparently very popular in the United States in the 18th and 19th century but since then its consumption went down to nothing while Americans switched to TV dinners and hamburger helper. 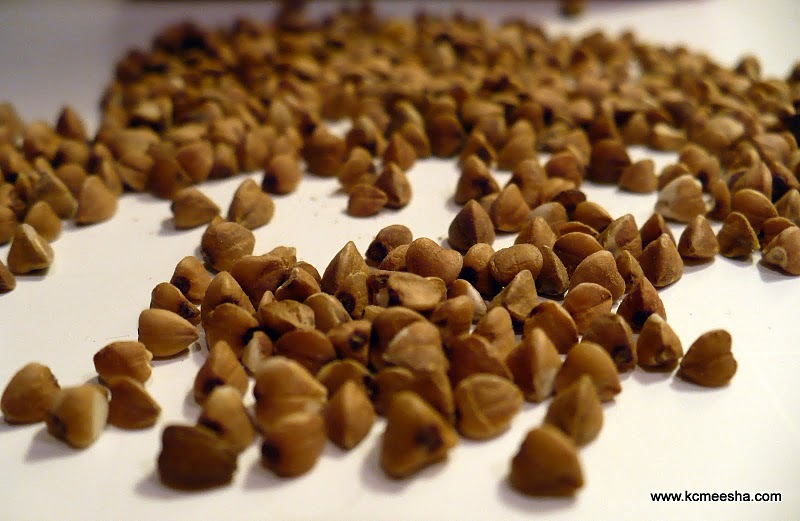 Considering that buckwheat is easy to cook, tastes great, and contains pretty much every nutrient in the book it’s a shame that this ancient food is not in every pantry in this country. 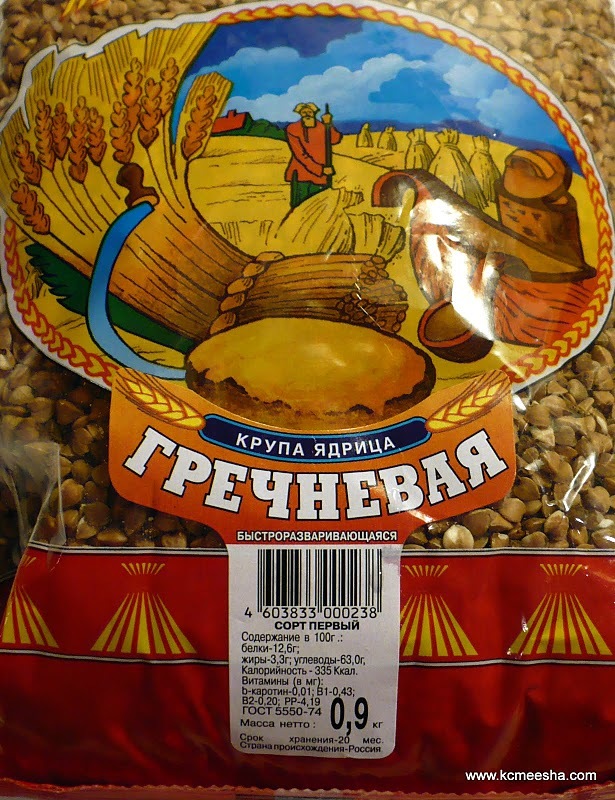 Sometimes buckwheat is not easy to find on the store shelves; Wolff’s Kasha may show up in the kosher aisle at the grocery store, other brands may be located where the grains and flours are sold, or at the Russian store where they sell buckwheat actually grown in Russia and Ukraine. 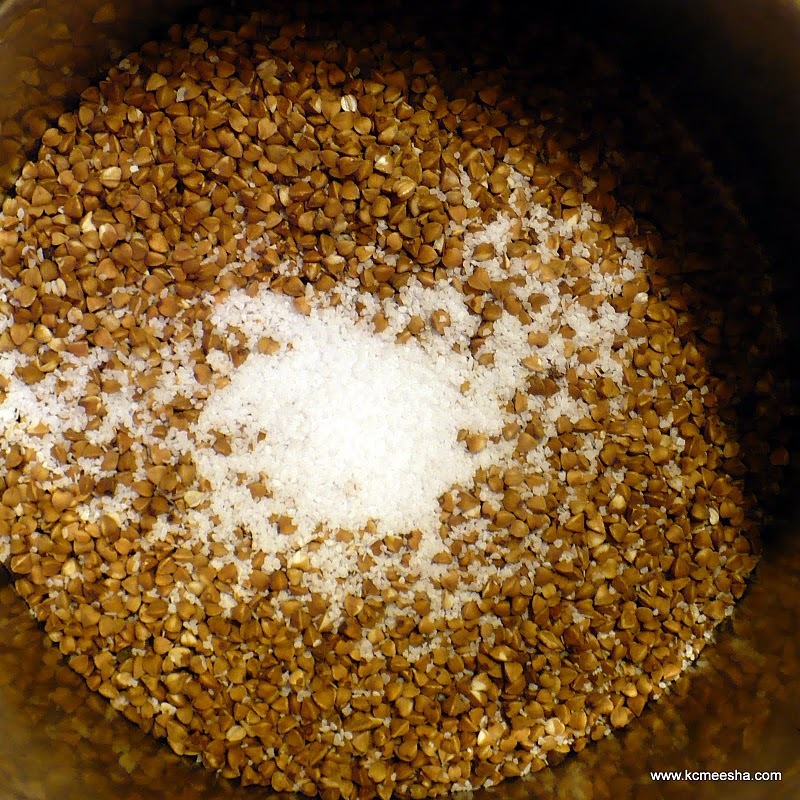 Technically buckwheat is the grain itself and kasha is a cooked product similar to porridge. Not all kasha is buckwheat and not all buckwheat is cooked into kasha. When buying buckwheat I prefer whole grain, roasted or not is your personal preference. Making kasha is fast and easy and there are multiple ways to do it. This is how my now-famous Mom does it. The ratio of grain to water is 1:2. Place one cup of buckwheat and a pretty good amount of kosher salt into a heavy-bottomed pan, cast iron pot or a skillet. Don’t worry about it being over-salted. Set heat to medium or little higher. Let roast, mixing occasionally. I usually go by smell, when it starts smelling like it’s beginning to burn you need to stop. It takes 5 minutes or so. While the buckwheat is roasting, boil a full kettle or pot of water. Pour enough water to cover buckwheat when it’s done roasting. I cover it with a lid immediately because it starts boiling and splattering violently. 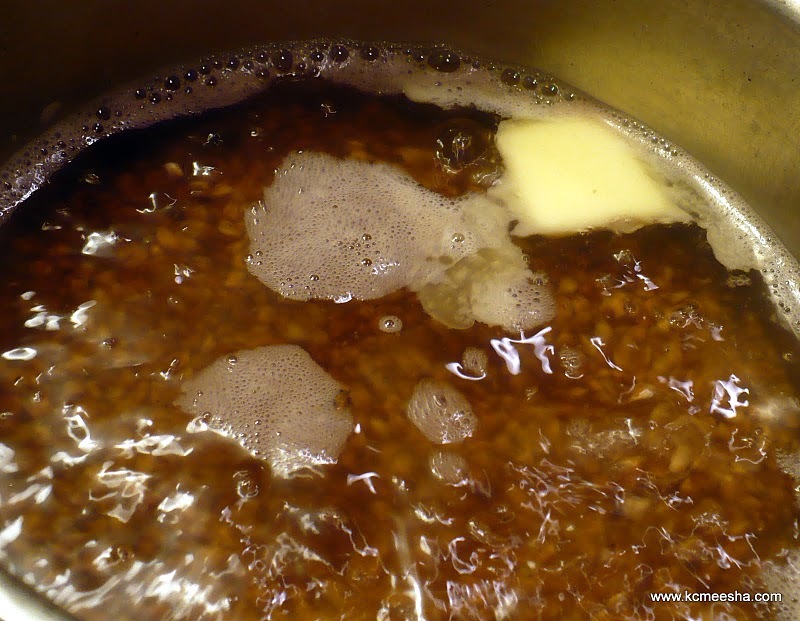 When the boiling, steaming and noise subsides, move the lid off just enough to drain water and proceed to drain as much water as you can without dumping the buckwheat. The water will be slightly brownish and this is the reason why you have to drain it. Repeat adding water and draining it one more time. Now add about 2 cups of boiling water and a chunk of butter; the amount of butter depends on your taste but consider an old Russian proverb that goes like “You can’t spoil kasha with butter”. Adjust salt to taste, since most of the salt used during the roasting was probably washed off. Now reduce heat to low, cover and cook for 15-20 minutes without mixing. Turn the heat off and let rest. Fluff with fork before serving. There are tons of variations and recipes with sauteed onions and/or mushrooms, buckwheat soup, buckwheat with milk, etc. ; it goes good with meat stew, can be used in place of rice or macaroni products and whatever else you can imagine. 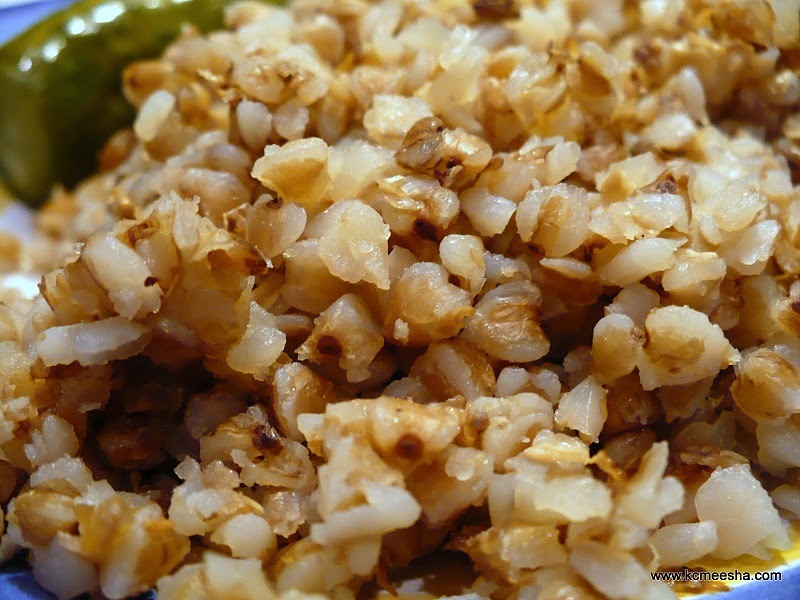 Buckwheat is also gluten-free and is safe for people who are intolerant to gluten. Next time you want something simple and delicious, think buckwheat.